It's hard to imagine a more perfect wildwater course than Limestone. This section includes two stout drops including the intimidating Limestone rapid that has messed up more than one persons day, and Joe's Diner were a wrong line means big stern hits. Otherwise it's continuous chop, minimal flats and a road along side for scouting, splits and for clocking athletes at over 25mph! This course is what wildwater racing is all about. It's adrenaline packed, all action, and huge fun. 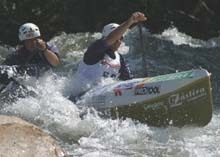 World Cup number 5 is a classic or long race starting about 5 minutes upstream of the crux rapid called Limestone and finishing about 10 minutes downstream at Willow Point. With solid whitewater almost the entire way, those paddlers with excellent whitewater skills and the power to drive through the chop would dominate the day. However, the line through Limestone rapid was tight and a surprising number of elite athletes were spinning out during practice. If the same were to happen in the race it would surely dash hopes of a solid finish. Not surprisingly, Vladi Panato (ITA) handily won the C1 competition over Stephan Stiefenhoefer (GER) and Stephane Santamaria (FRA). His power and grace through Limestone was awe inspiring for all those that witnessed it. Top ranked American Tom Wier finished 11th leading the the remainder of the pack. The big upset in the K1-W competition was when top ranked French paddler Magalie Thiebaut severely damaged her boat forcing her to pull over and dump out the water in order to finish the event. At the top of the womens competition familiar names duked it out. Michala Strnadova (CZE) took top honors over Sabine Eichenberger (SUI) and Nathalie Leclerc (FRA). The top ranked American paddler was Alena Sumner in 11th. In C2 multiple World Champions Vala/Slucik (SVK) won again over Fahlbusch/Fahlbusch (GER) and Raus/Pecek (CRO). The weight and momentum generated by these C2's really helped them flatten out the tough Limestone rapid. Bailey/Bailey placed 5th as the top ranked USA boat. 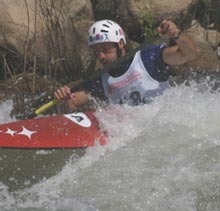 Czech powerhouse Kamil Mruzek not only won the K1 event. He also crushed the competition, winning by over 10 seconds which is a huge margin at this level. He left Florian Wohlers (GER) and Charles Chalet (FRA) wondering where that 10 seconds had vanished. Chris Hipgrave was the top-placed American again in 18th place just in front of Middy Tilghman (19) and Eric Giddens (20). World Cup 6 is a sprint race through Limestone. A sprint race involves two runs through the same course. Times are added together to determine the winner. Consistency and speed and mandatory requirements for a good finish. The sprint course was short at about 2 minutes, with Limestone slap in the middle. Organizers did a great job picking the start and finish lines to ensure paddlers would be entering Limestone right when the lactic was kicking in. And it sure caused some entertainment for the crowded banks of spectators.In C1 the top ranked Tomislav Hohnjec flipped and swam, while Stephan Santamaria (FRA) also struggled and had to improvise his exit out of the rapid. Italy completed a sweep in C1 with Vladi Panato wrapping up with another victory over Harold Marzolf (FRA) and Stephan Stiefenhoefer (GER). 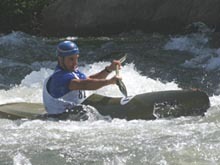 Tom Wier (USA) remained consistently smooth to place 10th as the fastest American paddler. After a devastating classic run the day before, Magalie Theibaut (FRA) added to her frustration by swimming in practice, but bounced pack to win the Sprint race over fellow French teammates Nathalie Leclerc and Nathalie Gastineau for a complete French sweep of medals. The unbeatable Michala Strnadova (CZE) ended up swimming in her second sprint much to the amazement of all the spectators and competitors. Katharine Edmonson topped the USA charts in 10th. Vala/Slucik (SVK) wrapped up the World Cups with one more victory over team mates Grega/Sutek (SVK) and Raus/Pecek (CRO). Bailey/Bailey (USA) placed 5th despite a quick spin-out in run two. With a lot at stake in the K1 event, there was little holding back to be done and it was great to see Carlo Mercati (ITA) winning this event over team mate Robert Pontarollo and Florian Wohlers (GER). Watching Carlo power through Limestone without missing a beat was like poetry in motion. Olympian Eric Giddens (USA) proved himself again placing 14th topping the charts over Simon Beardmore (18), Chris Hipgrave (19), Middy Tilghman (21), Dave Hammond (22) and Austin Krissoff (23). - did we expect anything less? Perennial favorites Vala and Slucik were victorious on the Kern. in her victory over Michala Strdnova of the Czech Republic. Strdnova won the overall World Cup rankings, however. Carlo Mercati strokes to the finish. Photo ©2003 Mike Edmonson.